Apple announced macOS Mojave back in June 2018 at WWDC 2018, where its most of the features were discussed in detail. Its public beta was launched by Apple back in July this year, then finally on September 24, 2018, Apple launched macOS 10.14 Mojave for the public. To make a smooth upgrade to the new Mac operating system. You must know about the newer version, why you are upgrading? Are your mac support the latest macOS? and know about other requirements if any. In this guide, you will learn about things you must do before upgrading or clean installing the macOS 10.14 on your mac without any problem. Some of the new features will make you crave for the latest version of MacOS Mojave, like in the latest update we have. In the latest update of MacOS Mojave, dark mode has introduced. In the dark mood, Dark colors are being used in place of sharp colors that make it distraction-free working environment. For example, The menu bar which appears at the top of the mac is no longer white with the text in black. It makes easy to focus on your work instead UI. However, Apple has made an announcement that Mac Pro models from 2010 and 2012 will be supported, but in coming time. Mac operating system OS X 10.8 or newer version. At least 2GB of system memory. Hard drive space minimum 12.5GB should available. If you have installed the older version than OS X El Capitan 10.11.5 then you need more storage space at least 18.5GB. Learn more how to check macOS version, Mac model/year, memory, storage, and more hardware and software related information. A good internet connection is required to download the installer file of macOS from the App Store. Macbook user should connect their notebook to the power source. Before taking any major step like installing a new OS, you should always perform a system backup in order to store your data in a safe place. If the installation goes wrong because of any system fault, you don’t want to lose your important documents along with your photo and music libraries. Learn how to back your Mac or make a clone of macOS drive on an external drive. Cloning the drive is the safest way, If anything went wrong you have the complete clone of the drive that you can restore. For system administrator in different institutions might need some more thing to take care of. They should review the prepare list before upgrading to macOS Mojave, see the prepare list on this page. When you know your mac is compatible with the current macOS and have prepared the Mac as guided above. Now, its time to install it. You can either upgrade existing version to the newest by just downloading and install it from the App Store. When you upgrade it from the App Store nothing will be changed on your computer except the operating system files. All of your data on the desktop, documents, downloads, installed apps will be the same. Fresh install of macOS Mojave will remove everything from the partition where you choose to install it. After a clean install, you can transfer your data from the backup drive. macOS Majove installer is available to download in the App Store for free and you can find it easily. Follow the given steps below to download it. In the search bar type macOS Mojave and then in the search results select Mojave and download it. You might need to enter Apple ID username and password for authentication. This will take some time to download due to a big file 5.7GB in size and also depends on your internet connection speed. During the download process, you can do whatever you want to do on your Mac. You will see a notification window once Mojave is downloaded to your computer successfully. Tip: If you don’t see any pop up then go to the Applications folder and you can see the macOS Mojave installer file here. 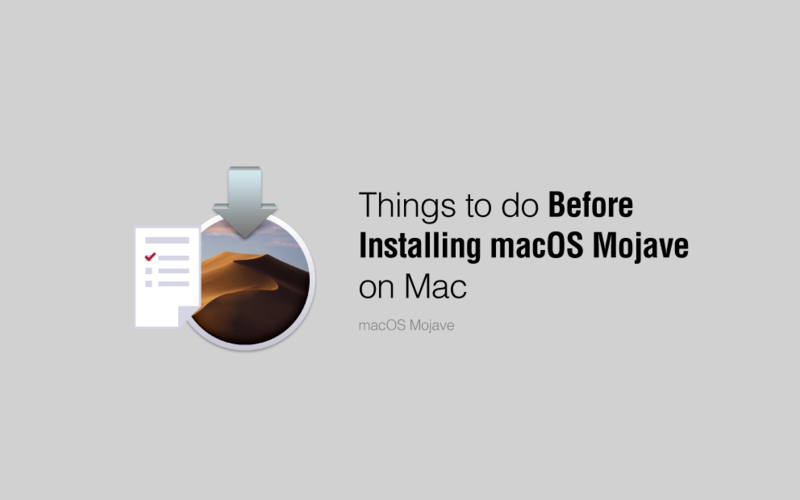 Follow the on-screen instructions to install macOS Mojave on your Mac. Things which you need to have and to do before taking any step further. macOS Mojave Installer, available from the Mac App Store. A 16GB or larger USB flash drive. Make your USB Bootable for the macOS 10.14 installation. Hold down the Option (ALT)key when it starts up. Select the USB Flash drive with MacOS Mojave on it from the list of systems to start up the installation process. Follow the installation process when appeared. Failed to install macOS Mojave? During the installation process, there is the chance something goes wrong. So you already have prepared for that by doing the thing before installing macOS mentioned above. Boot from the clone drive and restart the installation on your computer. Worst case you might need to clean install macOS. You have the clone drive keep it save to recover your data later. Let us know what you think about the macOS Mojave. If you need any further help to upgrade the operation system please leave a comment below. We will try to solve your problem to prepare and install then macOS Mojave.